The Elgee Power-Vac is a versatile machine designed to pick up many types of litter and debris indoors and out. It is well suited for a wide range of environments and industries. Granular material from manufacturing processes is no problem for the Elgee Power-Vac! Litter and debris on the parking lot or grounds? There is plenty of suction to handle that, too. With its Instant Action Hose, hard to reach areas like crevices and corners are easily accessed. In the factory, use it to get into tight areas around equipment. The Instant Action Hose is great outdoors for getting under shrubbery, park benches, and around other obstructions such as curbs, signs, etc. Simply lift it out of the holster and you’re ready to vacuum! Powered by gasoline, propane, electric, or battery engines, there’s an Elgee Power-Vac ideally suited to your application. Our 30-inch wide model is big enough for most jobs, yet is easily maneuvered through congested areas. For really large areas, we also offer a 40-inch Power-Vac. A 23-inch wide machine can be special ordered for unusually tight areas. Take a look at the demonstration video to see Power-Vacs in action with the Instant Action Hose: 634G (gasoline-powered) for an outdoor application and 634LP (propane) for an inside application . 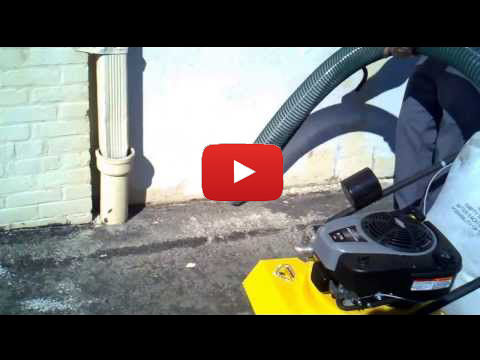 The Elgee Power-Vac is perfect for renovation projects! Paint chips, wood scraps, and similar wastes can easily be picked up. Much less dust and potentially harmful particulates are made airborne than during brooming, thus making a healthier and more pleasant work environment. Outdoors, vacuuming prevents debris from being carried into waterways by storm runoff. 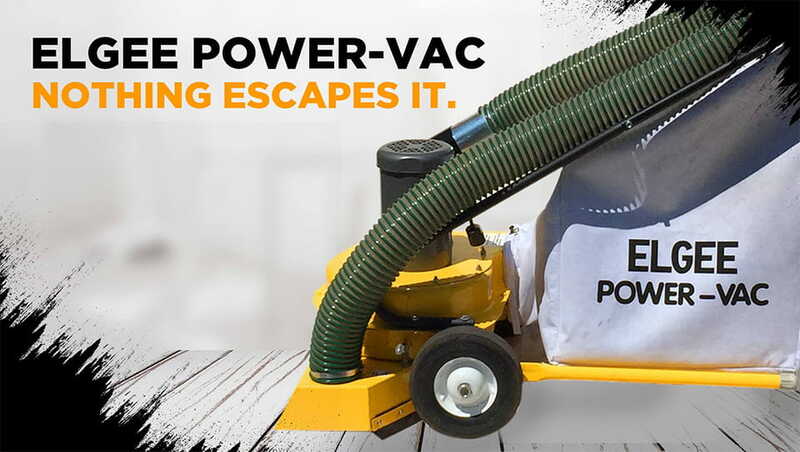 When full, the Power-Vac’s large zippered bag can be emptied into dumpsters or other receptacle. If you’re a painting, remediation, or renovation contractor, you need an Elgee Power-Vac! Battery or Electric powered models are available and recommended for indoor use. 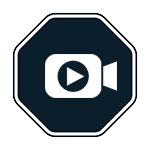 See the videos for inside and outside paint chip vacuuming.